The Splintered Mind: At What Age Do Philosophers Do Their Most Influential Work? At What Age Do Philosophers Do Their Most Influential Work? In an earlier post, based on an unsystematic sample, I estimated age 38. Today, with a broader and more systematically collected sample, I'm retracting that. Mostly. First, I created a massive super-bibliography consisting of all the bibliographies from non-historical entries in the Stanford Encyclopedia of Philosophy. I then examined the SEP citation patterns of all philosophers born from 1550 to 1919 who were cited in at least nine distinct entries -- 53 highly influential philosophers in total. The mean estimated age of this group is 44. The mean age remains 44 if I tweak the measure by adding in any works cited at least half as often as the most-cited work and then take the midpoint of the resulting age range. I would guess that 44 is probably a smidgen on the old side as an estimate of the age at which philosophers' most influential work is done, since most work brews for several years before finally appearing in print. In that sense, the 38-year-old estimate isn't perhaps too far off. But to my eye the more striking fact about the chart is this: How straight the line is from the mid-20s to the early 60s. If this were a bell-shaped distribution around 44, we should see flatter slopes at the beginning and the end -- as we do in fact see starting in the mid-60s. The straightness of the line suggests that there's isn't so much a peak age at which the most elite work in philosophy has been done but instead a long plateau from the mid-20s into the 60s, then tapering off. There are various potential explanations for the tapering off that seems to start in the mid-60s; I wouldn't rush to the conclusion that the tapering reflects cognitive decline. Other possibilities include decline in health and the prioritizing of other goals. of a particular age group. Encouraging! But I suppose it all depends upon which work you consider best. his process philosophy (which Russell called "muddle headed")produced very late in life. No question about Hume. The man was practically a prodigy. But do the publication dates fit to the age in which the philosophers had their most brilliant insights? And are their most brilliant insights really their most influential ones? Thanks for the comments, Anon & T.
Anon: Process and Reality qualifies by my second measure (which takes the midpoint of all work cited at least half as often as the most-cited work), shifting Whitehead older. Others (like Mill) are shifted younger by the second measure, keeping the mean the same. T: Right and right. We need to think carefully about what this does and does not show. There's always the exception--e.g. Roentgen's discovery of Xrays in physics. Of course, you'll never discover Xrays if you're compiling charts like this. I suspect Roentgen's teaching load wasn't so high either. It would be nice if we could compare this to an alternative measure. Do you have any plans at any point to do similar sorts of analyses with the Internet Encyclopedia of Philosophy or something similar? Brandon: No such plans yet, though it's not a bad idea. I am looking at JStor as a comparison point for my Philosopher's Index discussion arcs data. Hardy's "Maths is a young man's game" essay from 'A Mathematician's Apology' came to mind. adi shankaracharya? lao tzu? buddha? zhuangzi? rumi? this could go on .. am sure you get my point ..
and i won't get started on the, excuse me, uselessness of almost all in the west who ever got caught in the intellectual game that is "western philosophy"
Conc. "Maths is a young man's game" a discussion here and here. The life span of these philosophers is astonishing - it far exceeds normal life expectancy for any given time period. The average life span is 78 years. Which makes me wonder what they do in the 30 some years after their most influential work. If we assume that Aristotle joined the Academy around age 18, spent about 20 years there, and did his best work after leaving, the the 38-44 range may hold for him also. "The life span of these philosophers is astonishing"
Not really. Averages for life-expectancy in the pre-modern west include high infant mortality. If you made it past age six or so, you could live a good long time, barring serious misfortune. Also philosophers until recent times at least have come largely from social elites (and, being almost entirely male, escape the deadly roulette of childbirth), and so have enjoyed far greater-than-average protection from danger, disease, and famine. For the post-1800 guys, too, I'm suspect longevity is a consequence of social privilege as well. Yeah, what Kurt said. Also remember that I cut five who died before 60. A notorious problem in the institutionalization of mathematics is described by Gromov in this journal issue: ""Now there are no more Abels... It means that they have been destroyed. The education destroys these potential geniuses – we do not have them! ... " A "sociology of Philosophy" would have to adress such issues too. The institutionalization of philosophy differs much from that of mathematics, the people differ too (from their biogr. backgrounds on, as math was in contrast to philosophy for social outsiders climbing up the social ladder, e.g. jews in 19th century), so that it may make sense to lookm at thse questions. If you had a chart of female philosophers (I see only one woman on this list--is that right?) I suspect the distribution would look different, since many women delay their contributions by a few years when they have children. Anon: That could be so. The problem is that the sample size would be pretty small if we are looking for philosophers with high citation rates born long enough ago that we have some historical distance on them. Yes--that's why I didn't suggest that you actually try to construct such a chart. There isn't enough information. It's just worth mentioning, since you are making a generalization about the age at which philosophers do their most influential work, but I suspect that at best it's really a generalization about the age at which *male* philosophers do their most influential work. Or male Western Europeans of a certain era. Yes, I can imagine it varying depending on gender, class, culture, etc. 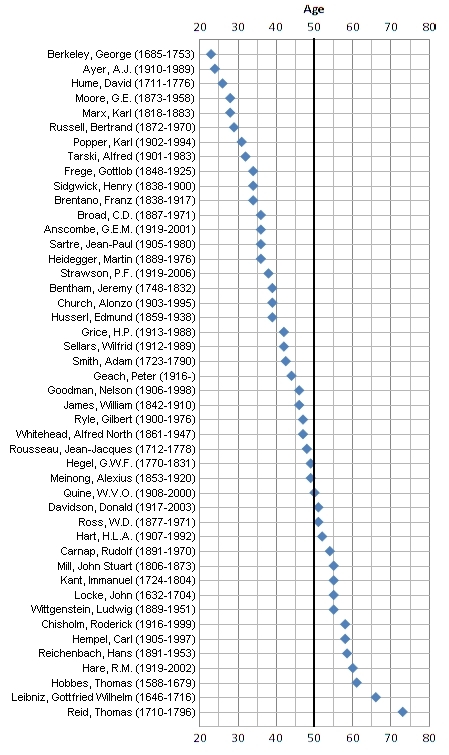 As I read the chart, the "trailing off" in the higher age range should be expected: The straight line indicates that there really is no particular age at which influential philosophers publish influential work -- i.e., they're just as likely to publish at age 25 as at age 65. But that assumes that they reach age 65. The older you get on the chart, the fewer people there are who have reached that age. So I don't think there's anything unexpected happening on the higher-age end of the chart, based on the spread of points up to that point. Unknown: Yep. I meant to include that in my comment about declining health as a possible cause (though I agree that's rather oblique). I did exclude philosophers who died before 60, as mentioned in the post.